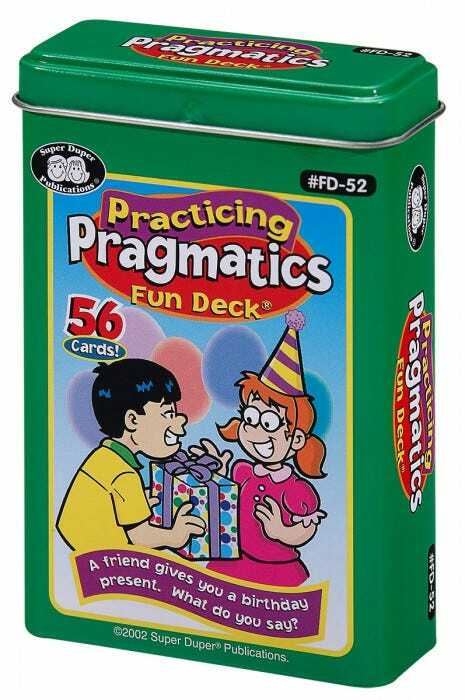 A fun and engaging way to practice various social skills. 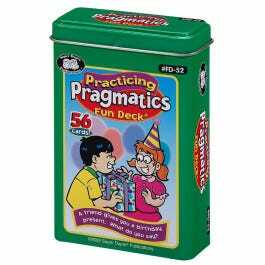 Having good pragmatic skills is a must for every child. Help students improve a wide range of essential skills - politeness, problem solving, expressing feelings, giving information, asking questions, telephone manners, and staying on topic. Visually explain appropriate behavior in a situation. Each card features a social scene with an open-ended question. Includes 52 colorful and motivating cards, four bonus cards for game variations, plus game ideas and content cards. Cards measure 2-1/2” x 3-1/2” in sturdy storage tin. Grades PreK –4.